Have you been searching for a special way to make your wedding day unique and unforgettable? Have you ever thought about wedding confetti cannons? We offer an incredible handheld confetti cannon selection for you to choose from in several sizes and with a myriad of colors and special effects to choose from. The confetti is sure to amuse and amaze your guests. What is a Wedding Confetti Cannon? The handheld cannon or as it is otherwise known, the party popper, has become an extremely popular party favor that helps to enhance any party and especially your wedding. These completely safe devices can fire a spectacular cloud of confetti up to 20 feet in the air. They can be used to create beautiful effects at virtually any special event and are a great way to add special effects to your photographs. 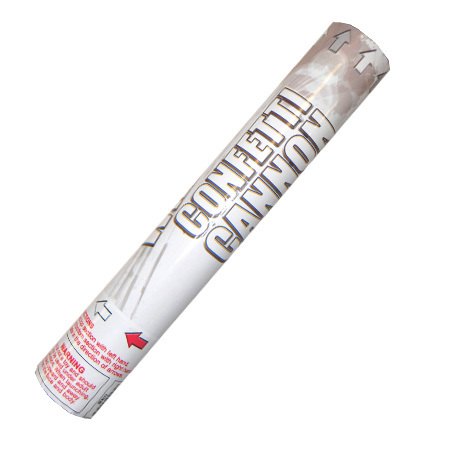 The handheld confetti cannon is a small device powered by a nitrogen canister. When the trigger is pulled, the nitrogen blast expels the confetti from the end of the tube and high up into the air. If you are looking for something a little different for your wedding, why not pass up on the hand thrown confetti and instead give everyone a confetti cannon to play with instead? You already know your wedding day is going to be the most important day of your life. You also know you want your guests to have a memorable day as well. The tradition of showering the bride and groom with rice dates back to pagan times and was intended to shower the newly married couple with blessings for prosperity. Recently, throwing rice fell out of favor as people mistakenly believed it would kill birds who ate it. While this myth may not be true, rice can prove to be a hazard as it may cause your guests to slip and fall on the pavement. Hand thrown confetti is difficult to control and may end up in large clumps being tossed at your guests. The wedding confetti cannon makes the perfect alternative. Each of your guests can aim their handheld confetti cannon overhead forming an arch of falling confetti as you leave the wedding ceremony or create clouds of confetti that add that extra touch of dazzle and color to your wedding photographs. While allowing your guests to each have a wedding confetti cannon is a wonderful way to add color and fun to your special day, you are also responsible for their safety. Each handheld confetti cannon is filled with high-pressure nitrogen gas. They launch the confetti out of the end quite forcefully and should never be pointed at another person's face or eyes. Also, the United States Post Office will not ship these, we must use an express shipping service. Now, browse our inventory and choose the right sizes and colors to make your wedding day simply unforgettable!